Gabriele D'Annunzio was one of the most flamboyant figures in the political history of modern Europe. A poet in the Byronic style and a popular hero of the First World War, D'Annunzio passionately believed that the sacrifices of war should prelude a new social order. His capture of the city of Fiume in 1919, which had been claimed by Italy as part of the settlement before the Versailles Peace Conf… erence, has been popularized and romanticized ever since. Ledeen uses information gathered from Italian and American archives and from personal interviews to examine the sixteen months of D'Annunzio's personal rule in Fiume, seeing it as a harbinger of successful mass movements of the twentieth century. 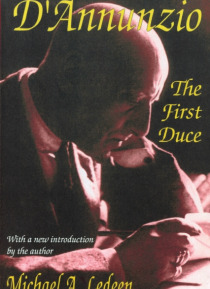 The connection between D'Annunzio and Fascism is central to Ledeen's narrative. Virtually the entire ritual of Fascist politics made familiar by Mussolini-the balcony address, the Roman salute, the dramatic dialogues with the crowd, the use of religious symbols in a new secular setting-was influenced by D'Annunzio at Fiume. Both were masters of a political style based on personal charisma. Each spoke for a "e;new"e; Italy and, eventually, for a new world. Each attempted to transform his countrymen into more heroic types by an ethic of violence and grandeur. But Ledeen brings sharply into focus profound differences between D'Annunzio's vision of a new world and that offered by Fascism. Significantly, D'Annunzio enlisted support from the most diverse elements of society-politicians and businessmen in addition to representatives of radical trade unions, anarchist groups, and the armed forces. Often sensationalized as a precursor of a sixties-style "e;dolce vita,"e; D'Annunzio's Fiume presented many of the phenomena considered novel or unsettling today: sexual promiscuity, widespread experimentation with drugs, clergymen wanting to marry, women demanding equal rights, youth calling for the elimination of the old, soldiers insisting on a democratic army, poets yearning for a beautiful world instead of a purely utilitarian one, minorities clamoring for their fair share of political power. From the dispassionate distance of half a century, Ledeen views Fiume as a microcosm of the larger chaos of our contemporary scene. Although he was removed from Fiume after a pitched battle on land and sea, D'Annunzio remained an influential figure in Italian politics. Ledeen presents him as "e;one of the great innovators and watersheds of the modern world. "e; This book will be of interest to historians, political scientists, and those interested in Post World War I Italy. An authority on Italian fascism and contemporary Europe, Michael A. Ledeen is Resident Scholar at the American Enterprise Institute in Washington. In addition to being a frequent contributor to The New Republic, The American Spectator, and 11 Giornale (Milan), he is the author of 15 books on contemporary history and politics.